Don't beat your steaks with a mallet, or coat your chicken with magical powder in order to make it edible. Improve any piece of meat by using this professional quality tool instead. Any boneless cut, no matter how good or bad, will taste better, cut easier, and cook faster after being tenderized prior to cooking. This version has 15 stainless steel blades that penetrate deeply in order to cut connective tissues, and create micro-channels within the meat. The result is improved texture, increased marinade absorption, even cooking, and meat that's incredibly tender when finished. Thanks to the patented, removable knife cartridge, this tool is easier to clean that others, and it's totally dishwasher safe. Simply press down to make it work, and quickly tenderize any amount of meat. The razor sharp blades make operation effortless, and the high quality construction ensures long lasting durability. It even comes complete with a protective that safely conceals the blades when not in use, and it's available with your choice of ABS or steel columns. Commercial Quality. Top of the line materials combine with a superior design to create a tool that's widely used in commercial kitchens, but the affordable price makes it perfect for the home chef as well. Removable Blades. For replacement or cleaning, the cartridge quickly separates from the frame. Reveal every nook and cranny to ensure it's sanitary, or insert new blades years from now when the original set dulls from constant use. NSF Certified. The only hand-held tenderizer to carry this certification, no other model can match it for ease and thoroughness of cleaning. Versatile. Use it on any piece of meat with the same results. Penetrate deeply to improve veal, beef, chicken, pork, wild game and more. Easy To Use. There are no complicated parts, or difficult procedures, so this tool can be used by anyone to prepare gourmet level dishes. Faster Cooking. The tiny knives cut vertical holes into flesh in order to distribute heat evenly and efficiently. The result is up to 40% faster cooking. Improved Yield. When you tenderize with this tool, certain meats will shrink less, so visual yield will be improved. Better Flavor. Any marinade or seasoning will penetrate better so the overall taste will improve as it's evenly distributed and injected in to the meat. Creates Heat Channels. Heat channels not only reduce cooking time, they also make food cook more evenly. Each piece will be just as tasty as the next thanks to the improved distribution, and even heating all over. FDA Compliant. All materials are tested safe, and approved for use with food. Use with confidence on any type. Dishwasher Safe. Take it apart, or keep it together. For easy cleaning, just place it on the top rack and forget about it. Lifetime Warranty. Thanks to the incredible quality and long lasting materials, this tool comes with a full lifetime replacement warranty for your piece of mind. 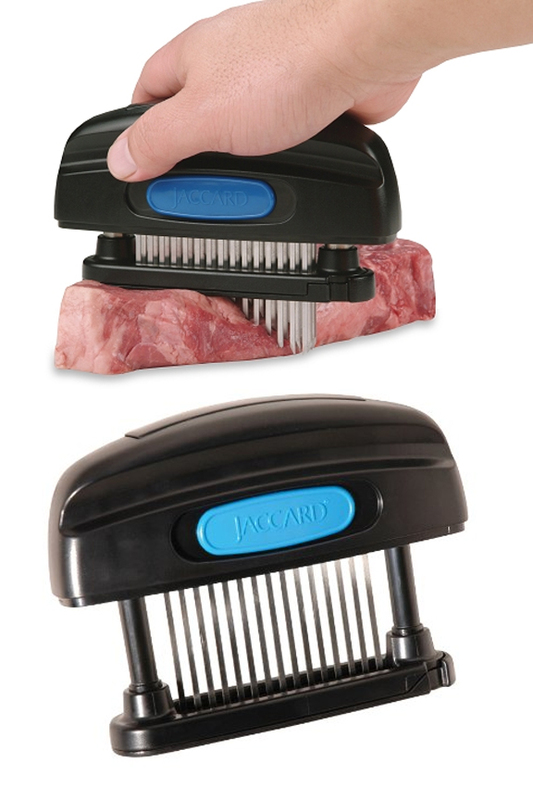 Unlike mallets that only affect the surface, mechanical meat tenderizers utilize long knives to penetrate the meat completely. The super sharp blades slide in effortlessly, and then surgically cut the connective tissue. The protein collagen is what tendons and ligaments that hold meat together are made from, and it's really tough to chew. By breaking it down, and slicing it free, prior to cooking, even cheap cuts will be mouth watering and butter tender when you finish. Other benefits include better penetration of rubs and marinades, reduced cooking times, even heating and reduced shrinkage. You could just use a fork, but the results will not be anywhere close to what you get with this tool. Instead of slipping through and separating tissue as you poke a hole, the razor edges will cut right through any tissues, and create micro channels for heat and flavor at the same time. Other tenderizers that look similar may come close to the effectiveness of this one, but superior construction, lifetime replacement, and removable blades make this commercial grade unit tough to beat. This Professional Meat Tenderizer has a single row of stainless steel knives, and it comes with your choice of column material. If you look at the overall frame, you will notice a thick vertical column on each side. The black, ABS plastic columns are standard, and quite sturdy. They'll work perfectly for most users, but for any one using it in a commercial environment, or for those that want the most durable and deluxe option possible, it also comes with stainless steel columns as an option. The metal frame will be more durable, and it has a look that some prefer, but selecting it will increase the cost of the product. No matter which version you chose, it will be well constructed, and it will operate smoothly and efficiently each time you use it. Preparing meat with this tool could not be easier. The large handle has a wide grip that's extremely comfortable, and the easy action ensures that anyone can operate it without trouble. As you press down on the top, blades will poke out from the bottom in order to pierce the meat. This version has a single row of fifteen razor sharp knives that will slice down to a depth of one inch. Although it can be used successfully without any practice or training, follow the steps and tips below to ensure proper function, and lasting performance. To prepare, lay meat flat on a cutting board. Remove bottom cover from tenderizer to reveal blades. Align tool over meat at one side, and rest plastic base directly on it. 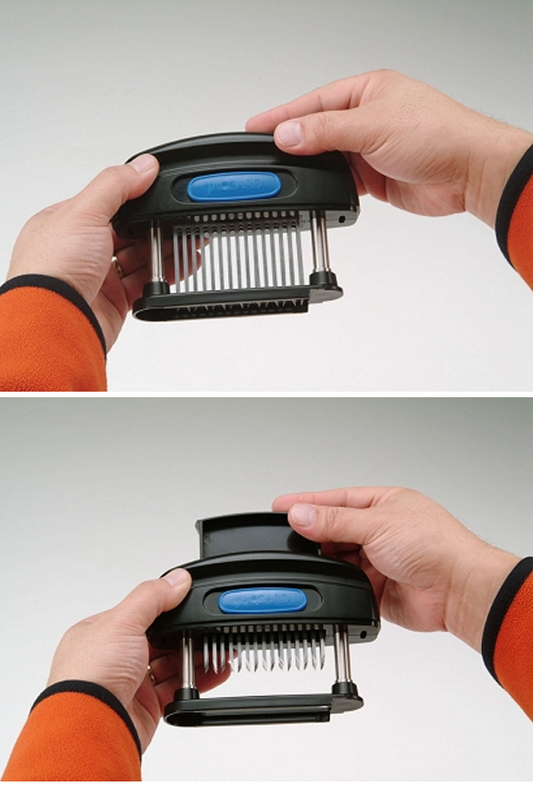 To tenderize, press down all the way. This will create one horizontal row of micro-columns. Move the tool a small amount, and then press down again. Continue moving and pressing until you have pierced holes across the full length of the cut. Work from one side to the other, and finish when you reach the other end. Continue with meat prep by applying a dry rub, sprinkling on seasoning, or marinading with your favorite sauce. Clean tool by hand washing or placing in the dishwasher. Clean it whole, or remove the blades for a more thorough job. To remove the blades, place flat on a cutting board, then press the blue button to the left and press down. The blade cartridge will release from the top, so you can grab and remove it. To remove the blade guide at the bottom, first remove the blades, then use the finger grip to slide it sideways and off the frame. To re-assemble the tool, first insert and lock the blades into place, then slide on the guide until it's securely fastened to the frame again. Save money when you purchase lower quality and cheaper cuts of meat, or look like a professional chef when you take a normal cut and transform it into a mouthwatering dish that will impress anyone that takes a bite. This easy to use tool offers one of the best ways to make meat more tender and flavorful, and it outperforms the competition when compared for sharpness, cleanliness, and durability. It's regularly employed in commercial kitchens at your favorite restaurants, and it's just as easy to use at home to improve barbecued food, baked food, or even pan fried food. The fast action is very thorough, and the top quality steel results in sharper blades that last longer. Press down without any effort to slice down into meat with no strength required. So simple to use, and with results that can't be denied, you will wonder how you ever lived without one. Dimensions 6" x 4.5" x 1.75"
Uses Use on pork, beef, chicken, veal, turkey, wild game and more. Increase flavor, improve texture and tenderness, and reduce cooking times. Dual Edge Knives Yes. Sharpened on both sides for prolonged performance. An easy way to improve every piece of meat you cook. It's easy to use, and offers professional level performance and durability. Impress friends and family with your gourmet skills, or save money when you purchase cheaper cuts of meat and make them taste amazing. Order Yours Today! good item received it on time. I bought this for my daughter. I have used mine for years and love it. When we visited, I found out she didn't have one. Fantastic. Meat cooks faster and it cleans up easily. Tried many kinds, this tops them all.